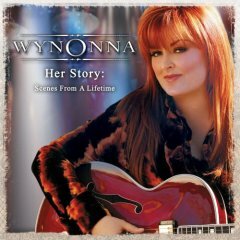 Recorded live at the Grand Ole Opry House in spring 2005, this double-disc set is in essence the companion to Wynonna’s new autobiography, Coming Home to Myself, in that it canvasses her 20 years of recording, both as half of the Judds and on her own. As always in concert, Wynonna’s powerful and impassioned vocals are the essence of her success to date. She can inspire a sentimental song like “Maybe Your Baby’s” with emotive gospel tenderness that warms the heart to its core and then blue rock it with side winding believability like “Don’t You Throw That Mojo on Me”. The acoustic nature of the release highlights the grit and gravi ty of Wynonna’s voice that employs you to dig deep down in your bones without the over production of homogenization. Wynonna’s version of “Help Me” reaches to higher heights than I have heard Ms. Judd reach to date. Unfortunately, the only cut that should have been left alone is “I’m the Only One.” It’s an immeasurable task to cop the vibe of Melissa Ethridge and her edgy presentation. It would have been better to stay far away from that cover. The up side is several songs rock harder and bluesier here than their original versions, especially Mama Judd’s blistering “That Was Yesterday,” and “No One Else on Earth,” which pushes the envelope of Bonnie Raitt-esque grooves. End Result, a few tracks leave a bit to be desired, but Wynonna’s husky vocal chords and soulful expression will keep you tuned in.